In just a little more than two years, Instagram has gone from zero to 5 billion shared photos. The popular photo sharing app announced yesterday that it had surpassed 80 million users and 5 billion photos uploaded by its users. As a comparison, it took Flickr 4 years and 7 months to reach 5 billion photos. Instagram has reached that milestone in less than half that time. Growth in recent months has been fuelled by the release of an Android app, which went live in April 2012. “The combination of Android and network effects as more people use Instagram mean that we’re able to grow faster now more than ever,” Instagram creator Kevin Systrom told VentureBeat in July. 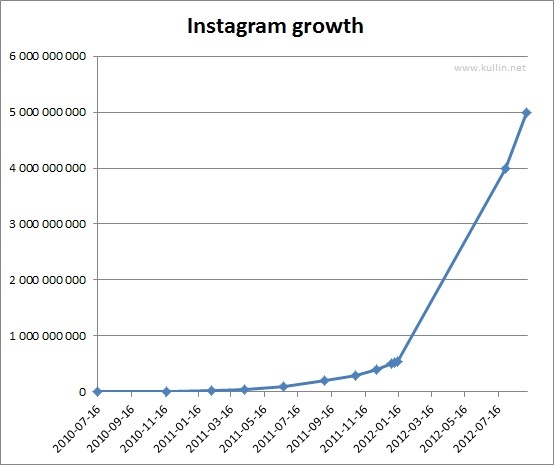 To illustrate just how fast Instagram has been growing, I made the graph below based on photo ID numbers (up to 550m, when Instagram changed how photos were identified) and official statements (4bn and 5bn). If you want a graph with the individual data points, click here instead. Here are the sources for each of the data points in the graph. 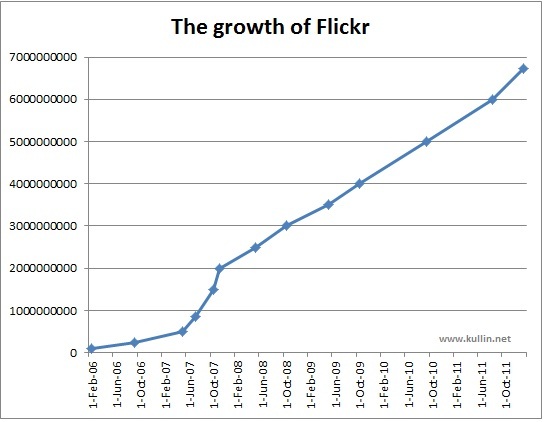 For a similar graph of Flickr’s growth from zero to 5 billion photos, see this blog post. Note: I am @kullin on Instagram if you’d like to follow me. 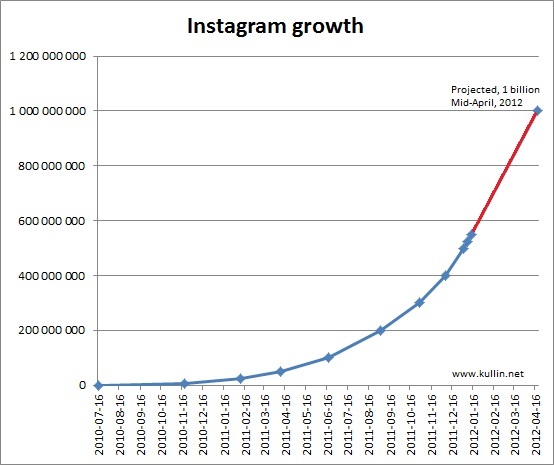 Instagram, one of my favourite apps, is growing like crazy. In September last year, I noted that users had uploaded 200 million photos, which meant that the growth rate in August was about 50 million photos per month. Now, it seems that users are adding the same number in just 11 days. 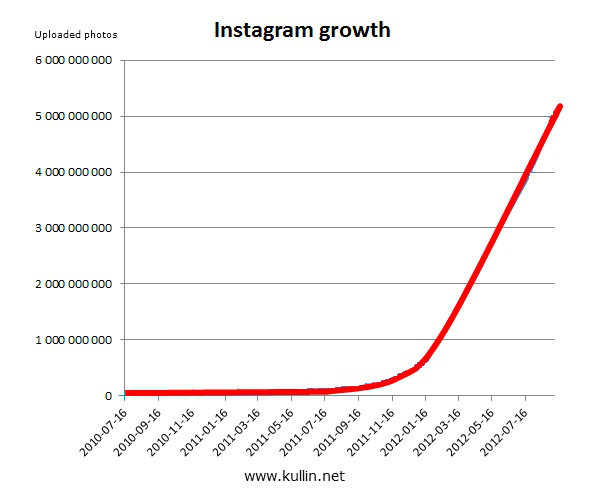 According to my calculations, Instagram passed 500 million photos on Jan 2, 2012 and 550 million on Jan 13. That means that 4.5 million photos are uploaded each day to Instagram and at that speed 1 billion photos will be reached about April 20, or possibly sooner if the service continues to add new users. Some even numbers are not available, I suspect because they are private (or have been deleted). The ID’s of the milestones have been recovered by using Statigram and Ink360.com. There’s no guarantee that the ID numbers from theses sites are an accurate reflection of the total volume, but previously this way of counting has proven to be quite accurate. Footnote: I’m @kullin on Instagram. The concept of social media releases and social media newsrooms is not new. By adding photos, videos and audio and easy sharing functionality, the chances that the content is spread across different social media channels increase. At least, that’s what we have been arguing for several years. Now there is also a study that confirms this notion. 1. Each press release share generates 2 new views; expands total audience by 70%. Creating shareable content and enabling sharing capabilities through the relevant channels can dramatically increase the number of views for releases. PR Newswire and Crowd Factory found that each share generates an average of nearly 2 click-backs to the original press release. Additionally, sharing of press releases across social networks increases the total audience, or social reach, for this content by nearly 70 percent. 2. 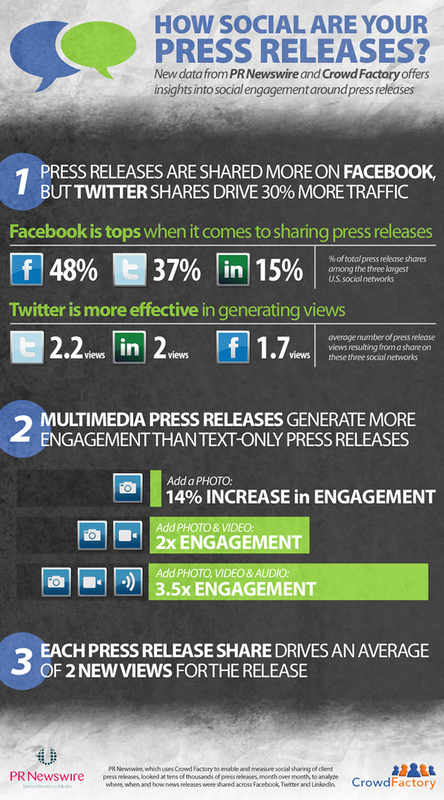 Press releases are shared more on Facebook, but Twitter sharing drives more traffic. Among the three largest U.S. social networks, Facebook is tops when it comes to sharing of press releases: 48 percent of press release sharing happens on Facebook, 37 percent of sharing happens on Twitter and 15 percent happens on LinkedIn. But not all shares are created equal: in spite of Facebook’s greater popularity for sharing, each share on Twitter actually drives about 30 percent more press release views than a share on Facebook. 3. Multimedia press releases generate 3.5 times more engagement than text-only releases. Not surprisingly, multimedia press releases that include photos, videos or audio generate more views, shares and clicks than text-only press releases. Adding a photo to a press release increases engagement by 14 percent; adding a video and a photo actually doubles the engagement rate. Press releases that contain photos, video and audio generate the most engagement, with 3.5 times more engagement than text-only releases.